Contacting YouTube can be tricky, but it is possible. We bring you the most up-to-date guide on reaching out to YouTube in 2019. If you need to contact YouTube for an issue you have, no matter the size of your channel, here are the best ways to get in touch with the platform in 2019. 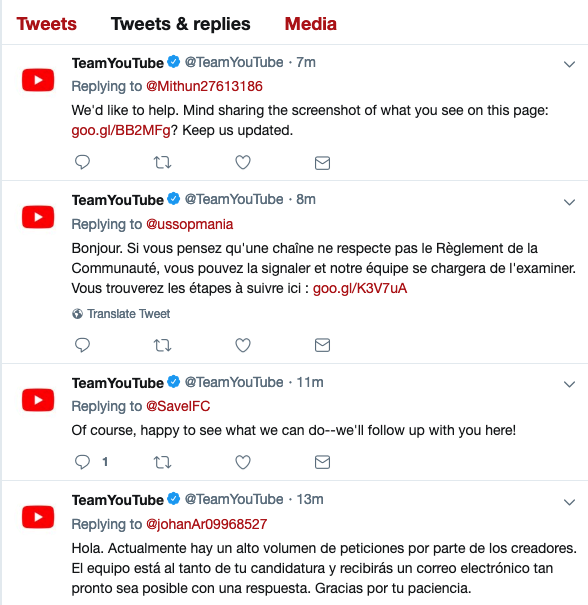 Without a shadow of a doubt, whether you are a video viewer or a video creator, the best way to get the quickest response from YouTube is through their @TeamYouTube Twitter account. As you can see, they do reply to questions on a very regular basis and are always keen to investigate unusual things that might be happening on the platform. They support nine languages through this feed and seem to operate 24 hours a day. Now something to bear in mind with the TeamYouTube Twitter account. They are asked a lot of questions. Sometimes they&apos;re asked the same question over and over again. So, don&apos;t be surprised if you&apos;re directed to the help pages from YouTube or automated responses. Also, if you&apos;re trying to get specific help with your channel, especially monetization, again, don&apos;t be surprised if they give you some standard responses about the team reviewing your channel. Think of the Team YouTube Twitter account as the catch-all point of contact for the platform. There are already many policies and processes in place that YouTube will want you to go through before they start to give you any personalized assistance. If Team YouTube can&apos;t help, then the official YouTube Help Community may be able to. Again, this is another resource where you may find answers to your questions, which are answered, not only by YouTube, but by YouTube users just like you and me. There are several categories to browse through or you can just flick through the latest post as if it were a forum. The thing to bear in mind here is that essentially anyone can ask a question, which also means anyone can answer them too. While there are dedicated product experts, you might want to double check the answers that are provided. You can also search through the Community database to see if your question has already been asked and answered or you can ask your own question via the link at the bottom of the screen. Now, if you are a video creator, there is a ‘Get Support’ link in the top right hand corner. If you click it, you can then choose get creator support, at which point you can choose what area of YouTube you need help with. 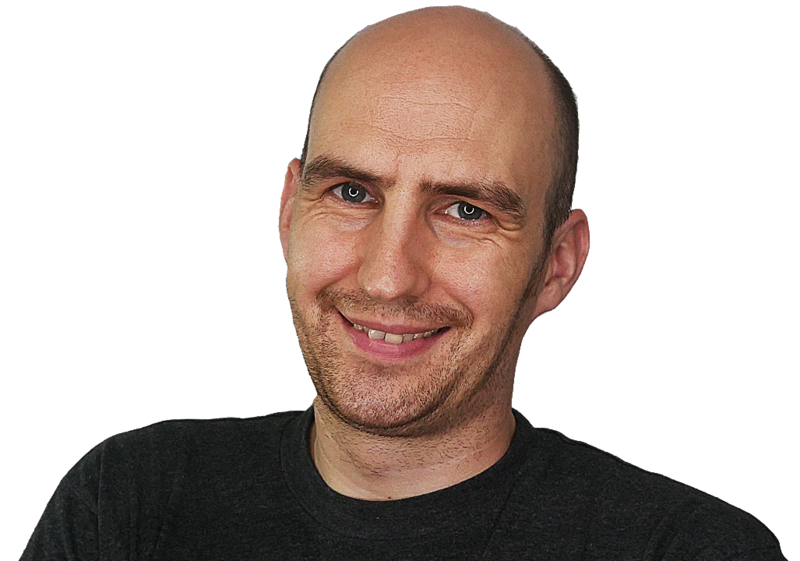 Depending on the size of your channel, you will then see different methods of contact. Now, as exciting as online chat might be, let&apos;s first look at email support, since all video creators should have access to this. With this form, you should be able to tell YouTube exactly what your problem is with your channel. But just remember, YouTube&apos;s response may still be quite general, especially if it&apos;s to do with monetization issues or copyright. While it would be awesome for YouTube to engage in one-on-one conversation with every video creator on the platform, that&apos;s simply not possible. So live chat is restricted to channels with over 25,000 subscribers and 100,000 hours of Watch Time in the last 12 months. Yeah, if you thought monetization requirements were tough, this is a whole other level. With all that being said, if you do have access, you can simply fill out a form, click start chat, and be placed in a queue to await the next available customer service representative. On your YouTube Channel, access the Creator Studio then click on the monetization section. On this screen, click on the help and feedback button at the bottom left and then click on send feedback. This will display a pop up where you can take a screenshot and send YouTube a message. We’ve already made a dedicated video on how this can speed up your YouTube monetization application, and had many successful testimonials on this strategy working. Of course the send feedback tool isn&apos;t just for asking about monetization. You can use it to report any issue on YouTube, and the advantage with this contact method is that it&apos;s available on almost all YouTube pages. So whatever it is you need to report, use this function. If you have a general interest in what YouTube is up to, then the Creator Insider YouTube channel is one you should definitely subscribe to. It&apos;s actually run by the YouTube team, and they upload regular updates about new features, bugs, and questions the YouTube community has about the platform. They will also reply to viewer comments within videos, but I wouldn&apos;t recommend using this as a way to contact YouTube about a specific issue you have. It&apos;s more about general conversation on YouTube as a whole. Now, if you haven&apos;t quite made it into the 21st century yet, there are some old fashioned ways you can contact YouTube. First of all, they have a fax number, if you can believe that - +1 650 253 0001. Now this kinda makes me wonder, everybody&apos;s contacting YouTube from Twitter, email, and so on, so maybe nobody&apos;s actually contacting YouTube through fax, so you might actually be able to get a quicker reply! That&apos;s a challenge for one of you to take, and I&apos;d love it if you made a video on it. And of course, YouTube does have a physical headquarters in San Bruno, California, USA, although there are more YouTube offices dotted throughout the world. I guess you could try and contact YouTube through snail mail, although I have no idea why you would want to. One thing I do recommend doing though is not turning up at their headquarters. YouTube had a major security incident in 2018 when somebody broke into their offices and started shooting at people. Tragically, they ended up killing themselves. So YouTube are very sensitive to this type of thing, don&apos;t do it. Now, none of this is a secret. YouTube do have a Contact Us page, where they include their address and fax number, along with lots of other links to various departments where you can speak to YouTube. And of course, if you want to contact vidIQ, you can talk to us here on the YouTube channel, through Twitter, Facebook, Instagram, and email us at support@vidIQ.com.